The Broadland parish of Wood Dalling is situated in mid north Norfolk, to the north of Reepham. Its name comes from the Old English for ‘the wood belonging to Dalla’s people’. 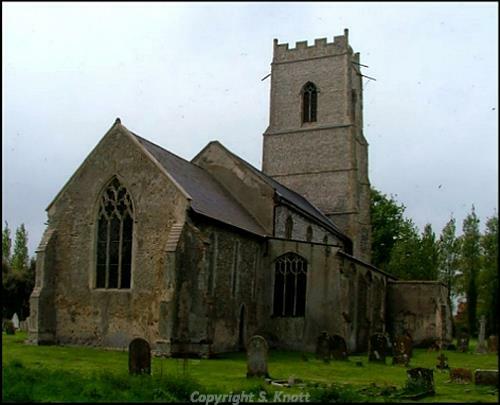 The parish has a long history, and was certainly well established by the time of the Norman Conquest, its population, land ownership and productive resources being extensively detailed in the Domesday Book of 1086. The earliest firmly dateable evidence of human activity comes in the form of a Mesolithic chipped flint axehead (NHER 3114), two Neolithic flint scrapers (NHER 3115 and 33652) and a Bronze Age stone axe hammer (NHER 3122). A possible Bronze Age ring ditch (NHER 36780), the flattened remains of a round barrow, has been identified by aerial photography analysis. The only Iron Age finds to date are some pottery fragments (NHER 37628) recovered in 2003 when the Bacton to King’s Lynn gas pipeline was being laid. A Roman inhumation burial (NHER 11200) was uncovered in 1837, consisting of an oak coffin containing human bones, a Roman dish and other pottery. In the soil above the burial were ox, sheep and goat bones and a stone quern. Other Roman objects include brick and tile fragments (NHER 37913) found in 2002 during work on the pipeline. Late Saxon pottery fragments (NHER 37628) were also recovered. The medieval period has left the parish with its oldest surviving building, St Andrew’s Church (NHER 3132). Lying prettily in the centre of the village, this building has one of the tallest west towers in the area, with a chequerwork plinth and knapped flints with patterns of stone blocks on its north wall. The rest of the building consists of an aisled nave, chancel and north and south porches. The north and south transepts were demolished in 1788. The oldest part of the church is the chancel, which is basically 13th century, as shown by the north wall. The east ends of the arcades are of the same date. The rest is a mixture of 14th and 15th century work, restored in 1899. The interior is light, uncluttered, full of character and ever so slightly ramshackle. There are a number of good brasses and memorials, together with 15th to 16th century woodwork. In the north aisle is the stone effigy of a priest, re-cut as a woman in the 19th century. Other medieval structures have not survived, but have left traces of their surrounding moats. A possible moat (NHER 11384) on the western border of the parish can be seen as a cropmark on aerial photographs. At Moat Farm, an L-shaped pond, possibly part of another medieval moat (NHER 22149), is marked on an Ordnance survey map. It was filled in in 1958 and no trace can be seen today. Quite a number of medieval objects have been recovered, including coins (NHER 30969, 35042 and 41828), pilgrim bottles (NHER 3116 and 37627), pottery fragments (NHER 37627), a harness mount suspension bar (NHER 33035) and a sword or dagger chape (NHER 35043). Of the post medieval buildings to survive, probably the earliest is Wood Dalling Hall (NHER 3129), a very interesting late 16th century red brick country house, two storeys high with attics under a pantiled roof. The south front has three gables and a lower offset gabled porch. Polygonal buttresses project from all the angles, rising to fine decorated circular finials and a group of excellent decorated chimney shafts. The house was built in 1582 for William Bulwer. His son William sold it to Sir John Hobart in 1632 and for a long time it remained part of the Blickling Estate. In the 1970s it was used as a Muslim retreat before being restored and converted to a pub and restaurant in the 1980s. It is now once again a private house. Church Gate Farmhouse (NHER 13127) on Reepham Road is an early 17th century and later red brick farmhouse, re-fronted in the 19th century, two storeys high with attics under a pantiled roof. The south front is of knapped and galleted flint with brick dressings and is five window bays wide. The second and fourth bays are slightly advanced and have steep stepped gables, the bay to the west having a doorway. The interior was extensively and thoroughly restored in the 19th century. To the northwest stands a small 18th and 19th century red brick barn and attached granary, now converted to residential use. Home Farmhouse (NHER 21854) on Holly Lane is a very interesting building, apparently a three-cell two storey early 17th century timber framed house but with a parlour cell completely of brick, though contemporary. There is also a grand staircase in the outshut. Additions were made in the 18th and 19th centuries and chimney stacks inserted. The building was much altered in the 20th century. Woodhouse Farm (NHER 3124), Pewit Farm (NHER 12125), Crabgate Farm (NHER 13118), Palm Farmhouse (NHER 13119), Manor Farmhouse (NHER 13120) and Norton Corner Cottage (NHER 31045) also have their origins in the 17th century. South of St Andrew’s Church is the site of a 17th century and earlier hall (NHER 14043), which reportedly burnt down in the late 18th century. Documentary sources state that a new façade was added to an older building in 1661. An 18th century illustration shows a two storey E-shaped house with shaped gables. At Primrose Farm is a small 18th century brick barn (NHER 18381) with timber framed gables above brick walls. The wall to the south has been rebuilt in 19th century brick. The roof structure includes re-used older timbers. One tie beam is a massive sill beam with mortise holes. Two gable rafters at the north end are also re-used. The most historically recent entry on the record is a common World War Two type 22 hexagonal concrete and brick pillbox (NHER 18382), situated southwest of the church. It was built in about 1940 as part of a network of anti-invasion defences of the time. P. Aldridge (NLA), 9 October 2007.